Matching Hawaiian dresses, Hawaiian shirt, Aloha kid wear. 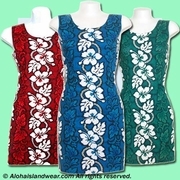 We offer large selection of matching Hawaiian dresses, Hawaiian shirt, girl dresses, boy shirts and infant clothes for the complete family or the complete Hawaiian wedding party outfits. 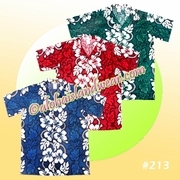 This pattern available in Red, Navy and Green.